DA member of the committee’s John Steenhuisen says it will be a problematic state of affairs if the country goes to election while the SABC does not have a board. Over 223 candidates have been nominated and the shortlist process starts next Tuesday. Steenhuisen says it is critical to expedite the SABC Board selection process. 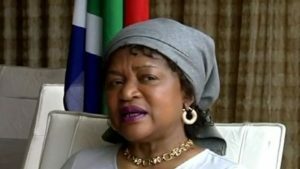 National Assembly Speaker Baleka Mbete says she has been in contact with State Security Minister Dipuo Letsatsi-Duba to sensitise her about the need for the State Security Agency to expedite the vetting of candidates who have to fill vacancies on various boards. This includes vacancies on the SABC Board, the Gender Commission and the Media Diversity and Development Agency, the MDDA. There is concern that the selection process of the South African Broadcasting Corporation Board could be delayed as the vetting of candidates is only done on those who have been shortlisted. Interviews could only start after the vetting process which could take up to two weeks. The Communications Committee will only start shortlisting SABC board candidates next Tuesday. “On the issues which relate to the SSA (State Security Agency) I have been in touch with the minister bringing to her attention the need for them to fasten the pace because as much as possible, Parliament would like to deal with those bodies where we have to fill in vacancies before we actually go to elections. Because remember even if we dissolve it doesn’t mean we stop working. I am in touch with the Minister. Actually as I was working in here she was calling. Probably she wanted to say something. I am going to follow up with that when we finish the meeting,” says Mbete. It is reported that SOS, Media Monitoring Africa wrote to President, Speaker and parliament Committee to urge them to expedite the appointment of a full SABC Board. The post Parliament wants SABC Board vacancies expedited appeared first on SABC News – Breaking news, special reports, world, business, sport coverage of all South African current events. Africa's news leader..